It's taken me all week to get the roof on my house (it's been a crazy week). Here is my current picture. I'll be setting this aside for tomorrow and Monday to put some time in on Shores of Hawk Run Hollow. I've been very neglectful of it lately!! Then I'll be back to my Neighborhood! Beautiful progress on LHN!! I love this project. 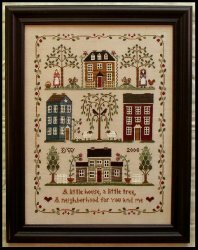 It took me a week to do the roof on my first house because I tried to stitch in hand on 40 ct and my stitches wouldn't lay the way I wanted them too, so I frogged. I put it back on Q Snaps and finished it and the house though now. I am sure the next house will be fine. I too have neglected my Shores of Hawk Run Hollow and need to pick it up. 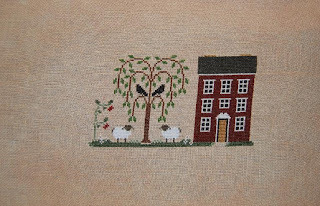 Now that I have the model finished that promised, I can concentrate on my own stitching! Your is just awesome! Nice work, Suzanne! That's the house I'm working on right now. Great job!